After the intensity of yesterday’s post I long for the simple again. Just the everyday thoughts and remembering the everyday stuff that makes life beautiful. Like the grown kids popping into visit and my refrigerator being full enough to feed them all, no problem. Full. Abundant. Lots of left-overs. Fresh stuff, too. Like the cool air on my bare arms last night as hubby agreed to walk at a nearby park. The clouds were cotton on blue and by the time we left the pink tinged them with glory. We bumped into some longtime friends who were at the lake fishing. Our youngest son rode his long board, weaving in and out of the those who, like us, strolled the sidewalk. Hubby and I went grocery shopping. We found a great sale and bought meat. Chicken breasts. roasts. steak. And we COULD. We could pay for it. How many times have I taken such simple graces for granted? Today blueberries arrived on my doorstep. I’m dreaming of blueberry pancakes. There’s already real whipped cream waiting in the fridge to top them. The roses are beginning to bloom, and I planted bright fuchsia and dark purple petunias. 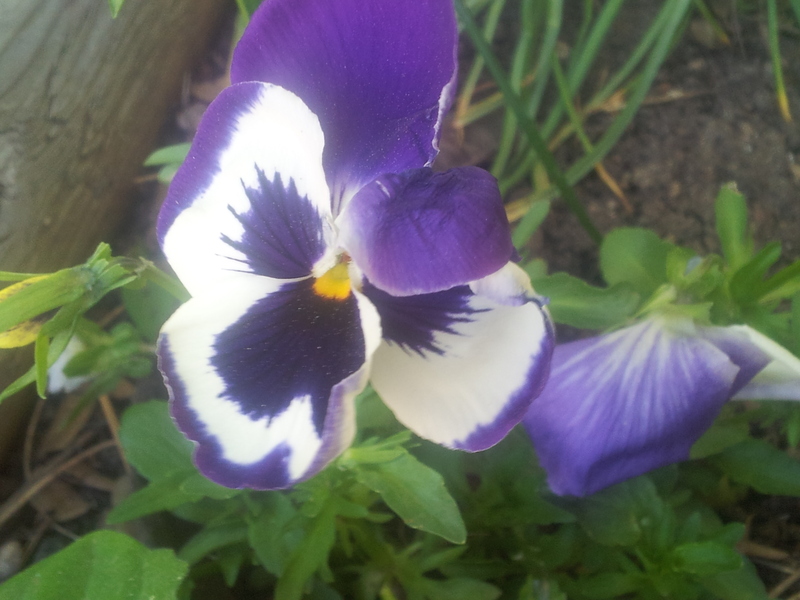 Would you believe a few pansies lived all winter long in my flowerbed, right through the snow, and have raised their pretty faces to greet me? 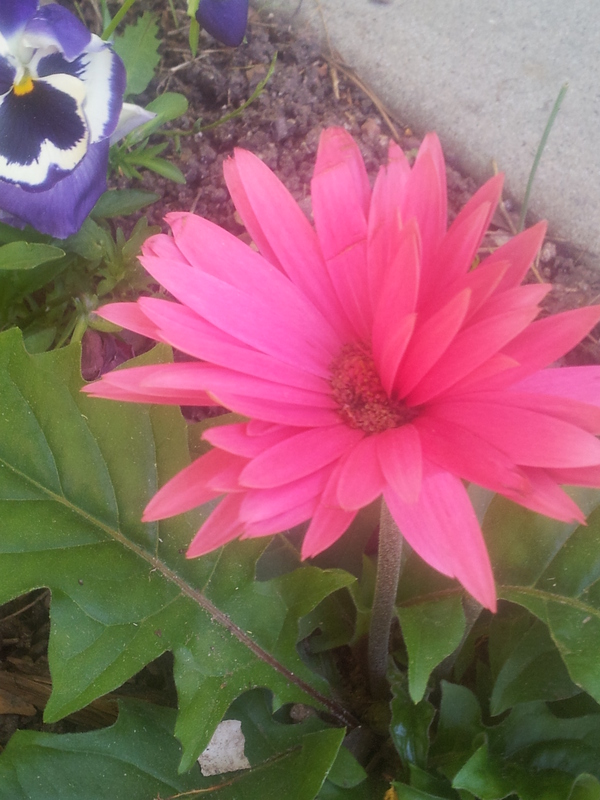 I put a bright pink Gerber daisy next to them, a feast for my eyes each time I travel my own sidewalk. I’m walking again, and those few pounds that tried to steal my weight loss are beginning to recede. I am empowered. Stronger when I walk. My new-to-me $25 dishwasher is amazing. After the week and a half of hand washing I’m especially grateful. And it holds more dishes and gets them cleaner than the old one did. And after a week and a half of the chaos of repairing the damaged floor and having clutter everywhere, my living room and kitchen feel huge. Clutter makes me claustrophobic, but oh the joy of putting everything in its place again! It makes an ordinary, familiar room seem new. 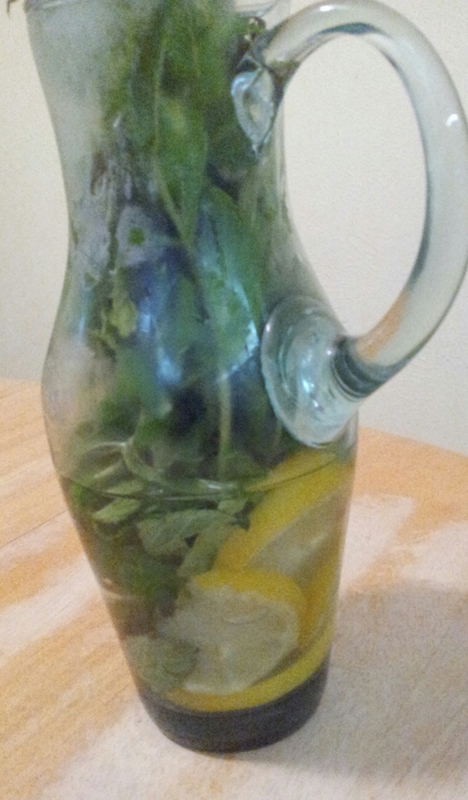 Fresh mint and lavender now grace my glass water pitchers, picked from plants next to the driveway. Sometimes I add lemon slices. This isn’t a fancy post. No careful wording, no effort to ease into a poetic feel, no going deep. Just hoping you and I can grab a little joy and rest in a little beauty. Refreshing. Great reminder to be content with what we have and to appreciate the every day details of our lives. Joy and contentment emanates from this post. And once again, you have effortlessly brought me to tears. I love you, my sweet friend. Love you forever, Kathy K! Thanks, Paul. I was surprised not to see a response from you on my last post. Was interested in your take . . .
Hiya Paula – I read your last post – and had a number of thoughts. All clouded by a confusion. One was becoming more and more aware of the “politics” in “stuff” your side of the Atlantic – and being blissfully out of the loop. A second was the “patriarchy” thing in home-schooling – and having no idea what that meant in context. And the third – and most important – was your italics at the top: a hesitancy in pressing the publish button. So let me add another thought. Those italics told me it “cost you” you to press the publish button. Yet even adding that thought might have been interpreted as something else in a context not mine. If this makes any sense at all – that post caught my attention. And having added these words – if you are able – I am keen to understand better. Because brave and loving it was – I just don’t understand why.